Ogle Equipment Sales, Inc. has been providing environmental solutions to industry since 1954. 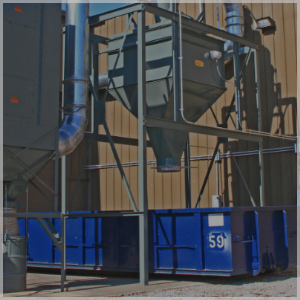 Over the years, we have designed, engineered and installed hundreds of air quality control products for a variety of applications, from dust and fume control to general ventilation. We visit your plant, analyze your needs, and recommend a product or system to satisfy your specific requirements. We can also work with you to turnkey the entire project. We strive for personal attention, quick quotations, and attention to detail on every project, from the time equipment is ordered to start-up. Our goal is to provide your workforce with a clean, comfortable environment, to improve their health and safety. With this accomplished, the workers productivity, energy, & accuracy will improve and your bottom line will increase. Ogle Equipment can engineer your project, apply the correct equipment to solve the problem and provide the installation if needed. We will clean the dust, mist, and fumes as well as ventilate the area by heating, cooling, or just circulating the air. And we will do this at the lowest possible cost.